Studies show that 1.4 million specialist digital workers will be required by 2020. If that’s the UK image, what will the numbers be globally? This is why I wanted to help students before they start their business journey. Sharing my knowledge to entrepreneurs and companies has always been a passion of mine. 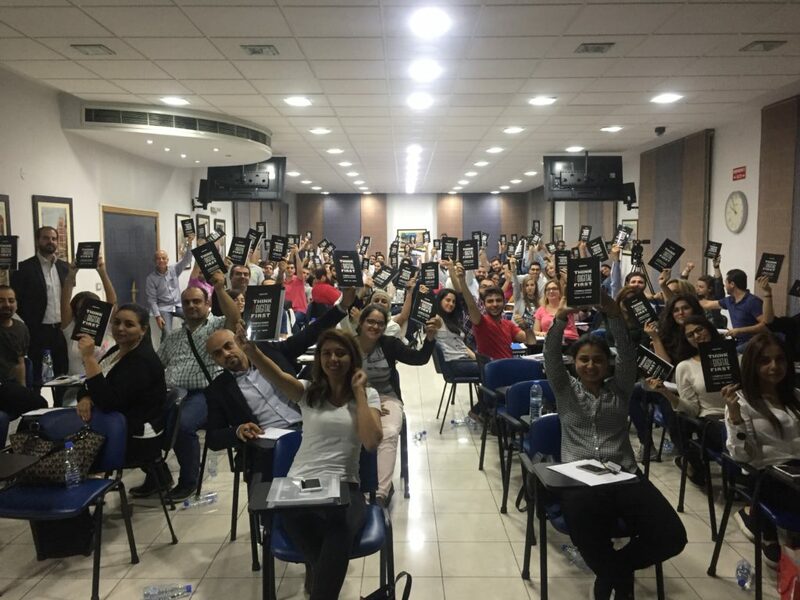 I have traditionally done this through being a professional speaker and CPD certified trainer both online and offline but for the past 18 months, I stepped outside of my comfort zone, and become a “lecturer” at universities and business schools all around the world. A couple of the places I’ve worked with in the last six months are; INSEEC (a private French business school in London with French & International students) and AUST (American University of Science and Technology) based in Lebanon, Beirut. Both INSEEC and AUST have different ways of working but following my most recent visit to Beirut last month, and currently working with INSEEC on a regular basis, there have been lessons I have learnt along the way. I always say that no matter what happens in life, lessons are always there to be learned and this is no different. I never thought I would be a “teacher” but it is something I have welcomed with open arms and really loved doing. You might be reading this thinking that becoming a teacher in your industry is something you are interested in, and if so; this blog is for you. 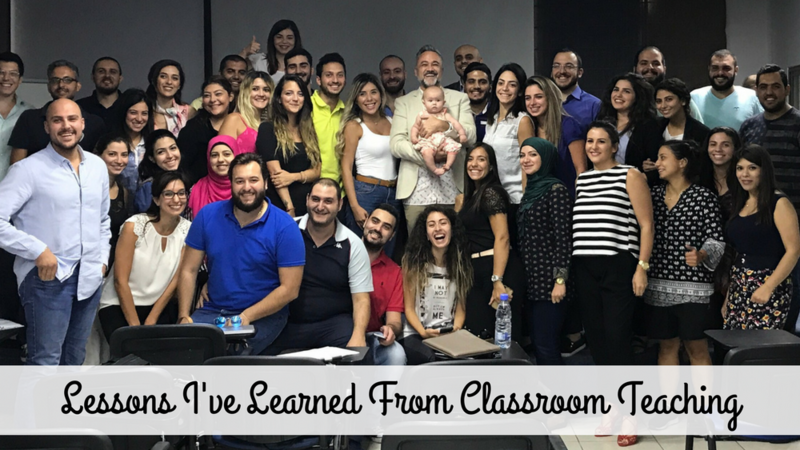 Keep on reading to find out some crucial lessons I have learned from classroom teaching. When delivering training in the classroom, it didn’t take me long to realise that there was a pattern forming based on the attention and focus of my students. I noticed that my students were most engaged with me at the beginning of the lesson, and this became harder to hold after the first 15 minutes. I also realised that if, for example, I was delivering a two-hour lesson, the first 15 minutes was (as mentioned above) engaging and enthusiastic but until the last 15 minutes, the attention and focus of my students dipped, and stayed on a relatively low attention span. This meant that I only had the full attention and focus of my students for half an hour of a two-hour session, and I had to think about what I could do as the “teacher” to bring their focus back. I made sure that I was using continuous cues, offering affirmations, engaging with every single student and most importantly, offering small breaks. In doing this, I noticed that my students were more energised, and alert during the “difficult to focus” time. This is something I do for every keynote seminar I deliver, but I had to do this in a different way as a classroom teacher. For every session, I would start by using a simple presentation slide to outline what would be covered during the session. This meant that expectations could be set straight away, and my students knew what to expect from the lesson. It is no secret that I am a “talker” and will cover a lot of important information in a very short space of time and when teaching students everything they need to know about Digital Marketing, this was obviously something I had to do. To help my students fully understand the most crucial pieces of information, I would always use slides with text in a different colour, or if I was speaking without slides, I would tell my students to write what I was about to say down on a piece of paper, or on their laptop. I made sure that my students were not making notes throughout the whole session as this would mean their attention was not on actually digesting the information, so when it did come to something that needed to be written down, I made it clear that this was an action they needed to take. Studies show that students relate, and digest information that they can associate to their real life. Knowing this meant that I could utilise my real-life examples, anecdotes and analogies from the past 25 years in business so that it would connect with them, and most importantly; learn from a practical place and theory. You may find it difficult to connect with students, especially when it comes to teaching digital marketing but I found that giving my students an insight into my life and what I have learnt as an entrepreneur helped keep their attention, and recognise similarities in their own life. At INSEEC, my students first language was not english. This meant that everything I talked about, and shared was something they had to digest, and take more time to think about. To make it as easy as possible for my students to learn, I would frequently summarise each section of my lesson. The last thing I want my students to feel is anxious because they are not fully understanding what I am saying and because of this, switch off in my classroom. To help relieve stress and boost confidence, I realised that short summaries of each section of my lesson was a great way to not only allow for my students to understand the full picture, but to ask questions and get the answers they need to move forward. The biggest difference between standing in front of a room and delivering a keynote speech for one hour compared to running a classroom session is the amount of time I speak for. Giving them the chance to take my teaching, and apply it in an assignment meant that they couldn’t just sit in the classroom and day-dream. They had to take ownership of the task I had set, and complete it to the best of their ability. The most successful assignments in my classroom was those that required my students to work collaboratively in a group. Working together with other students meant that different insights and opinions were brought to the table and the assignment became more well-rounded. Every single person learns at a different pace, and this was something I had to take on-board and make sure I was catering to all skill levels. There will be students that are more advanced because they have a better understanding of the digital world, and there will also be students that are relatively new in understanding the concept of creating an online business. My lesson objectives allowed for all students to be just as challenged and engaged regardless of their skill set. So, there are some of the lesson I have learned from classroom teaching. I would love to hear your thoughts, and what you have learned from becoming a “teacher” delivering a different “type” of training to students.